The Myrtle Women's Institute (WI) was founded on March 9, 1955 by Mabel Heron, a resident of Brooklin and a WI district president. The Myrtle WI was led by an elected president and executive, including first and second vice presidents, a secretary treasurer, and various committee leaders. 15 individuals attended the first meeting, a number that was to remain roughly consistent throughout the life of the organization. The mandate of the Myrtle WI was much the same as other WIs in Ontario at the time: the education of women regarding domestic science and its applicability to homemaking activities. Additionally, the Myrtle WI engaged in charitable activities through donations and participation in community events. Records from the organization also attest to its status as an important social network for many women of the region. All WI endeavors were orchestrated by standing committees comprising members. Committees organized lectures, prepared resolutions, participated in community activities, and created “Tweedsmuir histories,” or scrapbooks containing narratives about the region. Early Myrtle WI committees included the following: Historical Research and Current Events; Agriculture and Canadian Industries; Home Economics and Health; Public Relations and Community Activities; and Tweedsmuir History. Like other regional women's institutes, the Myrtle WI appears to have focused on the concerns of white, middle-class, Christian women. The organization's Tweedsmuir histories demonstrate this tendency, centering on the region's white European pioneers and their descendants. The organization appears to have disbanded in 1985. Records may have been transferred to Archives at Whitby Public Library in 2014. The precise donation date, donor, and prior custodians are unknown. The fonds consists of the Myrtle WI's minute books and Tweedsmuir histories. 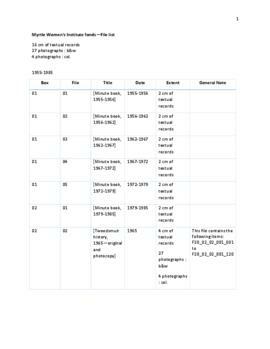 Records are arranged chronologically in subject files. Several photographs glued into Tweedsmuir histories have become detached. These photographs have been placed in envelopes which are attached to photographs' originating pages. The archivist maintained records in their received physical order. Some records in the fonds may be protected under copyright. Permission to reproduce copyrighted materials must be obtained from the copyright holder(s). See archivist for details. A file list is attached. Description created by Gillian Dunks in December 2017.